"If the school is so unsafe why are we continuing throughout the school year?" Mom Brenda Dawson questioned. "If it's so unsafe it has to be closed, how is it safe for them to stay in until June 11th?" GREENSBORO, N.C. — Brenda Dawson says she's been in the dark since Friday. "People were learning about it on the news and on Facebook," Dawson said. She said she got a call from Gateway Education Center's principal over the weekend. The school services special needs students. Her 9-year-old son Connor has been going there for the past three years. "The principal called me on Saturday and explained the school would be closing because it was going to cost 11 million dollars to fix the school, that it was so bad they just could not repair it." But she said that's contradictory to a facilities report Guilford County Schools published back in January. "I just think its contradictory to the facilities study," Dawson said. "The study says for Gateway to have 'no change.'" "I have navigated the wheelchair past a trash can catching water," Dawson said. "But no, haven’t seen any problems bad enough to close." "I know Gateway, the building is a little older, but I have never seen it to be unsafe for my daughter, ever." Her 14-year old daughter has attended Gateway for the last 11 years. District Superintendent Dr. Sharon Contreras wants students to relocate, citing new study results showing poor indoor air quality. That study was conducted six weeks ago. “I believe we have to do what is best for our students, particularly our most vulnerable children,” wrote Contreras in a newsletter. So, students might not have to leave after all. We'll know more when Dr. Contreras makes her official recommendation to the Board of Education on Wednesday morning. Meanwhile, Dawson says some parents got a letter in the mail from the Principal of Gateway on Tuesday afternoon. The letter states the windows, roof, grading and gutters are the problem. 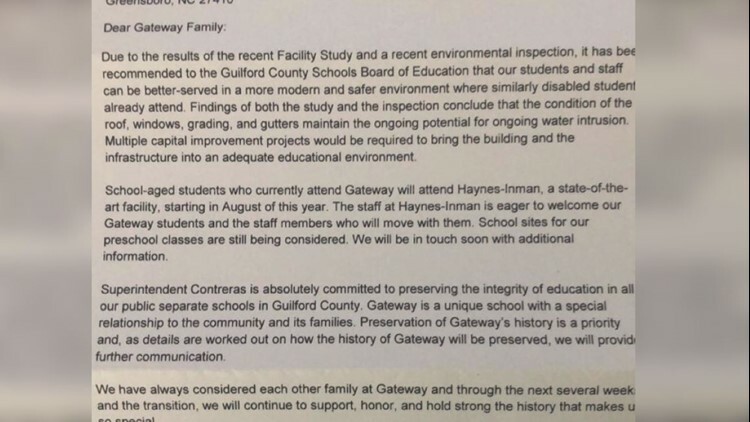 Guilford County Schools is recommending that Gateway Students relocate to Haynes-Inman, about 15 miles away. Dawson says the longer commute will severely disrupt disabled students' routines. She also questions the schools reasoning for keeping student there for the rest of the year if it is, in fact, so unsafe. "If the school is so unsafe why are we continuing throughout the school year?" Dawson questioned. "If it's so unsafe it has to be closed, how is it safe for them to stay in until June 11th?" Dr. Contreras will make her recommendation to the Board of Education Wednesday at 11:30 a.m.
"We’ve all been screaming that they’re not answering our questions," Dawson said. "I hope we get answers because we deserve them."